Fishing is in my blood. 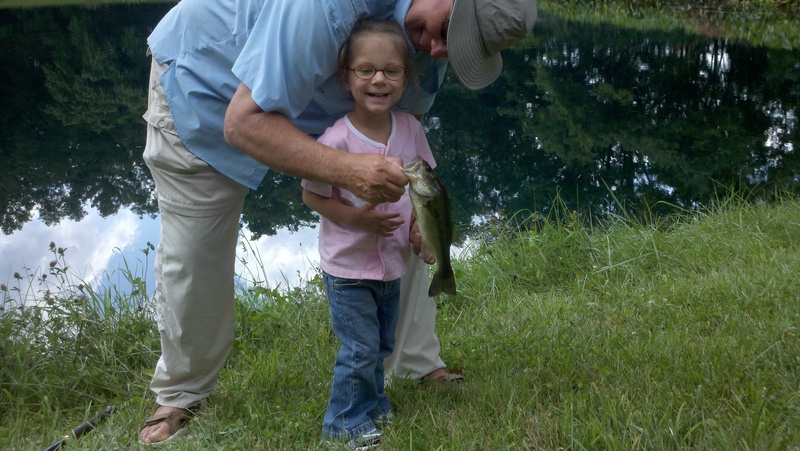 The stories I will share have to do with the joys of family, friends, and sharing fishing. I hope to describe many people I love. I hope to describe many wonderful moments on various waters both at home and away. Enjoy! 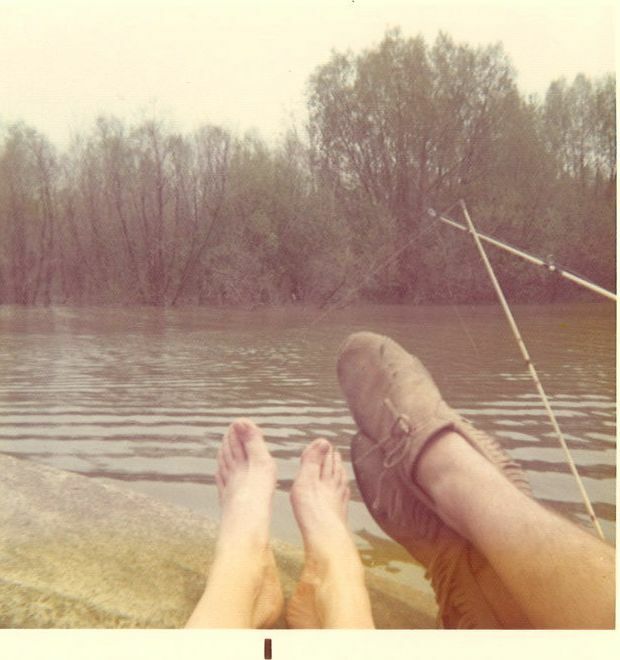 My blog takes the name of one of my favorite ways to enjoy fishing. Practice casting in my front yard which has no water nor fish. Our home is located at the top of a tee intersection with a three way stop. Trees prevent effective casts in our back yard and so I use the unobstructed portion of the front yard to practice my casting and conduct a long term study of the behavior of my neighbors. I have gathered sufficient data to conclude that 50% of the drivers stopping at our intersection roll down their car window. 75% of those rolling down their windows ask, “Catching anything?” The question is often delivered with a smile and a smirk that delivers the message, who is this curious man or as my daughter just said, Who is this total weirdo? I have taken pride in this yard over the years but there is another yard in the neighborhood, a ball yard, upon which I have spent a lot of time over the last twenty five years. My sons Nate, Pete, and Seth all played baseball for the Thomas Worthington Cardinals on the field. While they were in high school, I participated in the parent group and did work on the field, spring, summer, and fall. After the varsity Cardinals went 0-18 during the spring of 1990, the head coach went to Italy for the summer and I was drafted to coach the summer version of the Cardinals upon which son Nate played. I coached legion baseball on the field. I started a summer baseball team for college aged players after son, Pete, went to Baldwin Wallace and returned after his freshman year with no summer team to play on. We called the team the Columbus Bombers. Following the example of my wife, I felt that if you host a party, the party site needs to be perfect. Bomber games were typically on Sundays and I would arrive at the field at 6 am to mow, weed, edge, drag, sweep dugouts, and paint bases! The field was always spectacular by game time, at least through my eyes. After my boys graduated, I began to coach Cardinal baseball with Steve Gussler as my leader. We lost heart breakers and won championships. We laughed together and as Coach Gussler fought cancer, we also learned to cry together. We taught a little baseball and a lot of life and I even led yoga in the outfield. My connection to the front yard of Cardinal baseball was so strong that I would drive by the field to check to make sure things were in order on the way home for church on Sunday and on the way home from work Monday through Friday. Coach Gussler worked on the field with a relentless passion to make the field a show place. 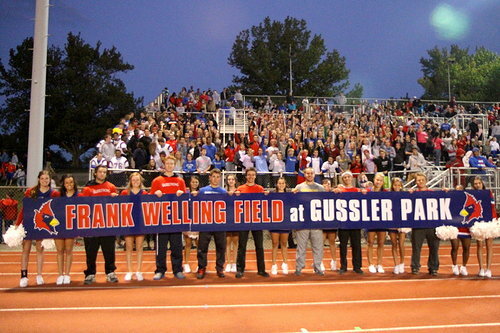 In fact, the field is now known as Gussler Park. Guss made one thing clear! No one was to use the field other than the Cardinals and their invited guests. The retort was delivered by a dude with long hair, skinny, with an intonation that my Grandma Rowe would have concluded belonged to a smart aleck. I was certain Coach Gussler would never have given permission for a pick up softball game to played on our baseball diamond. I had not been so upset since I made my only trip to Fenway Park on a non game day and during our tour discovered that there was a celebrity softball home run derby being conducted in front of the Green Monster! Outrageous! “Call whoever you want, ……” shouted the scruffy one as he completed the sentence by referring to a typically unseen part of my anatomy. Sullenly, I rolled up my window and headed home. The intruders continued hitting that obscene softball all over our beautiful baseball field paying me no mind and giving no respect. Several years ago, good friends, Dave and Margy McCarthy joined my wife, Lauri, and I on a cruise on the Norwegian Cruise Lines ship, Epic. The itinerary included a day long stop at a small island off the coast of Belize named Roatan. As soon as the trip was booked, I began investigating the possibility of a bonefish trip while in port. 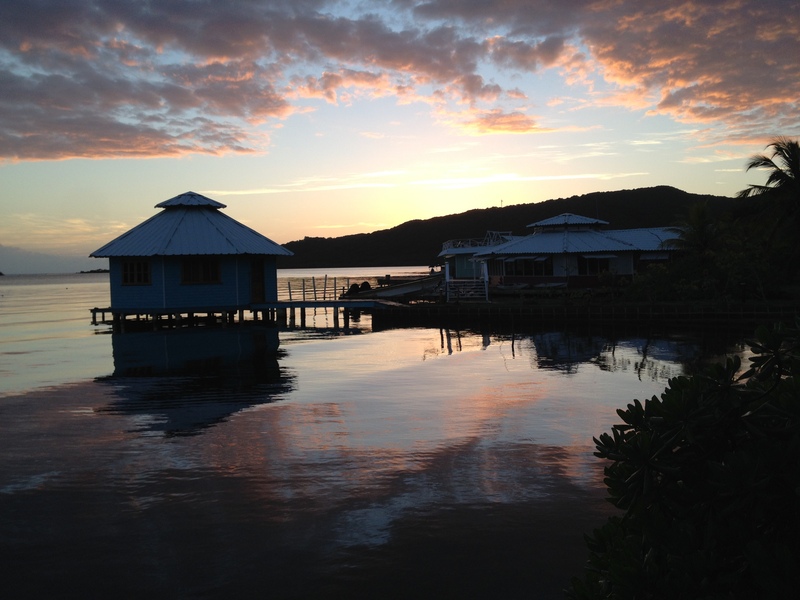 A Google search of “Roatan bonefish” revealed a website for an eco-lodge known as the Mango Creek Lodge. My phone call to the Lodge went to voice mail but was was returned in a few minutes by the owner, a former resident of Colorado. I learned that when the economy was booming in the early part of the decade, he decided to buy Mango Creek which was built in 2003. His plan to be an absentee owner with an on site manager had failed and as a result he and his wife moved to Roatan to manage the five bungalow mini resort. A couple of years before the cruise, I had begun to teach Dave how to fly cast. My good friends at Mad River Outfitters in Columbus shook their heads in disbelief when they heard I was trying to instruct somebody in the art of fly casting as my own casting skills are modest at best. Dave is an agreeable friend who would never do anything to disappoint a buddy. Once while we were fishing for smallmouth bass in the Olentangy River, Dave fell and gashed his wrist on a rock in the first 15 minutes of fishing. We had waded in opposite directions, so I knew nothing of his fall until the end of our fishing an hour and a half later. Even then he said nothing. The dried red blood from his wrist to his elbow told the tale of the mishap. Dave knew me to be a bonefish addict and in a true demonstration of his habit of putting others first, he readily agreed to accompany me on the bonefish trip in Roatan even though he had never fished for bonefish or any other saltwater fish. The proprietor of Mango Creek Lodge informed me that he would send the most reliable taxi driver on the island to pick us up at the pier where we were to disembark. The driver’s name was Jose. I was assured that Jose would be holding a sign with the words “Mango Creek Lodge” so we could easily pick him out of the crowd of drivers seeking the easy tourist fare. Roatan is a narrow island approximately 30 miles long and the owner asked if we were docking at Port Royal Harbour, one of the two Roatan piers, where cruise ships disgorged their passengers. At his suggestion, I called the customer service number for NCL and the hard to understand operator confirmed that indeed our ship would be docking at Port Royal. 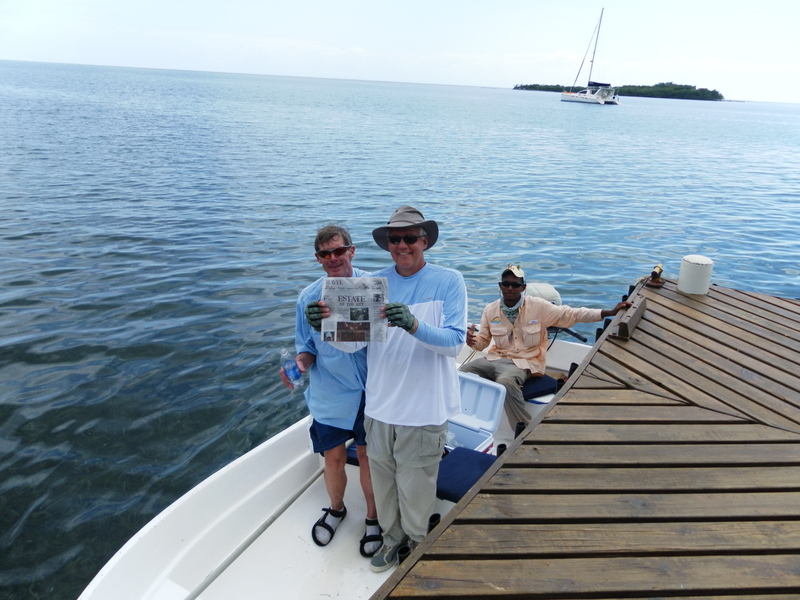 The plan was for José to transport us to a little bar called PJ’s at the opposite end of the island where our fishing guide would be waiting with his skiff to transport us to Mango Creek Lodge which was not easily accessible by road. Knowing that cruise ships wait for no passenger, we needed reassurance that there would be a foolproof plan to return us to the ship on time. The owner said that José would return to PJs at 2 PM to pick us up insuring a timely return. Based on this long distance information from someone I had never met, I confidently promised Dave and our wives that there would be no problem with the return. We would be back no later than 3 PM as the ship was to sail at 4. Our ship docked early in the morning. Dave and I were first in line to disembark and we were loaded with fishing gear and the requisite amount of cash, eager to begin our fishing adventure. After clearing security, we descended the gangway and gazed the length of the very long pier for the most likely exit to start our search for José. Of course, we picked the closest exit. As we neared the street, we carefully scanned the horde of taxi drivers for someone holding a sign that said “Mango Creek”. There were no signs. I shouted out, “Is there a driver here named José?”. Surprisingly, every single driver waiting was named José. Now we were confused. No sign but 50 Joses’. Suddenly, a young local named Michael frantically approached us asking if he could help us arrange transportation, give us a local tour, or serve our needs in any other way. I asked Michael if he knew where a bar named PJ’s was located. Of course, he was certain of its location. Michael and I were approached by a local policeman who told Michael to leave us alone. Obviously, self-appointed tour guides were not popular with the local gendarmes. Another quick but futile glance for a sign led us to head to the other end of the pier where we approached a security desk and asked if there was any particular place where we could expect to be picked up by a prearranged taxi driver. Security personnel directed us back to the exit where we had encountered Michael. Then I asked Security whether the pier where we had docked was Port Royal Harbour. “No, Mahn, you are at French Harbour, Port Royal is at the other end of the island.” So much for the accuracy of NCL’s customer service operator upon whom I had relied. By now we had spent the better part of a half-hour attempting to make connections on the first leg of our fishing trip. Great uncertainty clouded over our once optimistic heads. Obviously, our José was at Port Royal Harbour and we were not. We returned to gate one and suddenly the fear of missing out on a fishing adventure overcame me as I gazed desperately across the street looking for a Mango Creek sign with a José attached. I noticed Michael. “Michael, got a minute? Can you get us to Port Royal Harbour quickly? We have a driver named Jose’ waiting for us there!” We were now only a half hour away from the time we were to meet our fishing guide at PJ’s bar. “Of course!” Michael responded with great enthusiasm. Michael approached a taxi driver, spoke in Spanish, and suddenly the driver threw open all three doors and gestured for us to climb in. Dave and I jumped in the back and Michael jumped in the front. Off we went. Only after we were underway did I ask, “How much?’ Michael responded for Pedro, “$30!” “Fine, keep driving, we have to find Jose’ as soon as possible!”, I pleaded. Dave rolled his eyes. As it turned our taxi driver was not a José. His name was Pedro. After a 15 minute drive down narrow traffic jammed roads, Pedro pulled to the left and exited at Port Royal Harbour where another 100 drivers were waiting for the passengers of the second ship to dock at Roatan that morning to disembark. We repeated our desperate scanning of the gathered drivers who were enjoying their morning coffee as they jabbered excitedly in anticipation of naive travelers such as me and generous tippers…such as me. As we watched, Michael approached us. “Hey, Mahn, why not let Pedro and I take you to PJs?” I replied, “Let me make a call.” I quickly called the proprietor of Mango Creek, who sounded relieved to hear from me. “Where are you?”, he asked. “José has been looking for you.” I explained our predicament and the proprietor insisted that José was at Port Royal waiting. I promised to look again. After a 10 minute search, no José appeared carrying a Mango Creek sign. I approached Michael and asked “Are you sure you know where PJ’s is?” Without saying a word, Michael walked away and approached the gathering of taxi drivers with whom he started talking in an animated fashion. Apparently, Michael was trying to figure out where PJ’s actually was even though he had been certain of its location earlier. In a minute, he returned with the promise that he had talked to someone who had given him explicit directions on how to get to PJ’s. I looked at Dave, we shrugged simultaneously, and crawled back into Pedro’s cab. Michael crawled in the front seat and off we went. This leg of the trip cost $75. About 300 yards down the road, Michael and Pedro began to speak urgently to one another in Spanish. Suddenly, the conversation stopped, Pedro jammed on the brakes, and Michael jumped out of the front seat. He leaned in the back window and said “Give me $30 and Pedro will do the rest of the round-trip for $40. I need to get back to town and arrange more tours!” Pedro nodded his agreement. After I handed Michael the $30, Pedro sped off toward the end of the island. As we traveled, there were fewer and fewer houses and more jungle. We began to sense a tad of isolation. After another 10 minutes of driving, Pedro seemed to slow the cab and began looking from side to side. A bad sign, I thought to myself. All of a sudden a native of the island who was dressed in orange exactly like Ricky Fowler, the PGA golfer, on a Sunday, came striding down the road. Pedro eased the cab a stop and rolled down the window. More excited Spanish was exchanged. Now “Ricky Fowler” jumped in the front seat and Pedro somehow communicated to us that Ricky claimed to know how to get to PJ’s. At Ricky’s bidding, Pedro turned off the paved road and the cab began to navigate a narrow gravel road that headed up a very steep grade to the top of a very, very tall hill. There were no houses anywhere. Dave leaned over and whispered “I think we are going to be killed.” As we crested the hill, Ricky pointed to a ramshackle hut on a small sliver of silver bay with a dock in the rear. “PJs!”, he exclaimed. 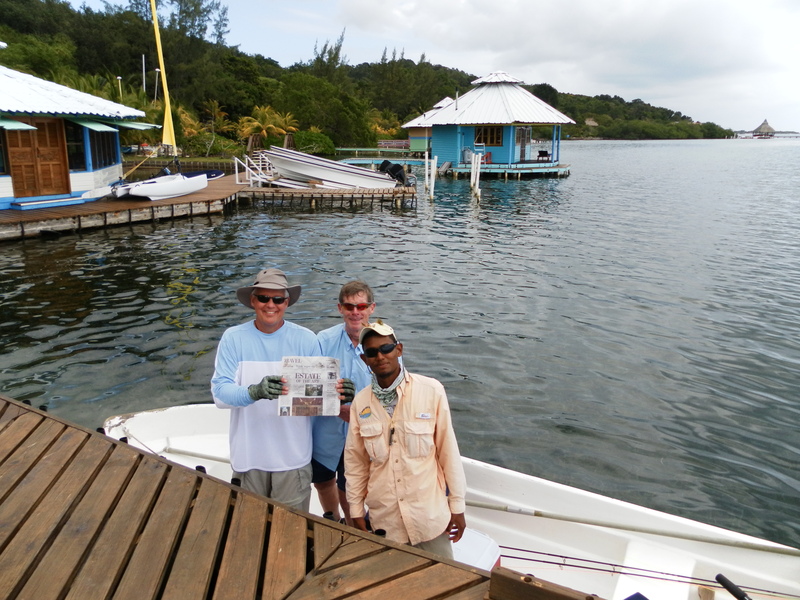 As Pedro parked the cab, we peeked through the four stool bar and saw our guide waiting patiently in his bonefish skiff which floated gently against the dock. His anglers had arrived. Pedro and Ricky seemed quite proud. Ricky of course had earned a $10 bill. I approached Pedro and gave him half of the remaining fare and reminded him that we needed him to be back at PJs at 2 PM to pick us up and return us to the ship. There would be no other cabs in the very sparsely populated residential area surrounding PJ’s. Without hesitation, he promised to return on time. He jumped in the cab and took off spewing gravel as the rear wheels spun. We walked through the empty bar with no bartender and asked permission to board. Permission was granted and the fishing part of our adventure commenced. Our guide shook our hands and welcomed us. He was 19 years old and was also named Michael. He had reasonable English which he used to inform us that he was taking us to the lodge to prepare for fishing. After a short boat ride, we saw five gorgeous pastel colored bungalows on stilts in the water next to a sturdy dock attached to what turned out to be the kitchen and dining area for the eco-lodge. Once we were introduced to the proprietor, everyone seemed to settle in as we were all very relieved that the logistics had somehow worked out. Of course, poor José earned no fare even though he was the “best taxi driver on the island”. We fished for bonefish through late morning and early afternoon. The flats were spectacular. We waded on bottom which felt like coral popcorn as our feet crunched around our feet which shuffled through crystal clear water. The skies were piercing blue and the sun was determined to illuminate everything that swam. There were fish everywhere. Many of them were bonefish. We did manage to catch one after about an hour. At noon, we were returned to the Lodge where we were served a spectacular launch of fresh mahi-mahi, hush puppies, and fruit. The Lodge owner insisted on giving us a tour while extolling the merits of our planning a return trip. I was antsy because the clock was ticking and the bonefish were waiting. Or so I thought. We caught no more bonefish after lunch. All the while, of course, in the back of our minds, we were wondering “would Pedro show up on time?” The words were not expressed but I am confident that Dave and I were sharing the same thought. As our guide eased us back to PJs at 2 PM, we saw Pedro standing next to his cab. He had obviously gone home and showered because he was scrubbed up and in his Sunday finest. We paid and tipped our guide and headed through the still empty PJ’s. Pedro explained that we had enough time to make a slight detour on the way back. He also mentioned having to make a stop. As it turned out, shortly after dropping us off, Pedro was in a taxi wreck and needed to stop at a body shop to make arrangements for the repair. We overheard the animated tone of spirited negotiation as Pedro and the body shop owner hammered out the terms of the estimate. After the deal was struck, Pedro jumped back in the cab and drove us a scenic coastal route on the north side of the island as we enjoyed the spectacular scenery of Roatan. I am the son of a preacher. As a youngster, Easter Sundays were spent in church. Once married, Lauri and I enjoyed Easter with our family. Yes, We Made The Kids Pose! However, one Easter Sunday I played hooky and went fishing for “bull reds” in the Indian River watershed near Titusville, Florida. I traveled to the area with my son, Seth, who played baseball the following week with his Thomas Worthington High School baseball teammates at the Cocoa Beach complex. The Cardinals competed against different high school teams from all over the country who would escape northern climates and head to Florida for an abbreviated “spring training”. Having done some research, I booked a fishing trip with Capt. Kelly Wiggins. 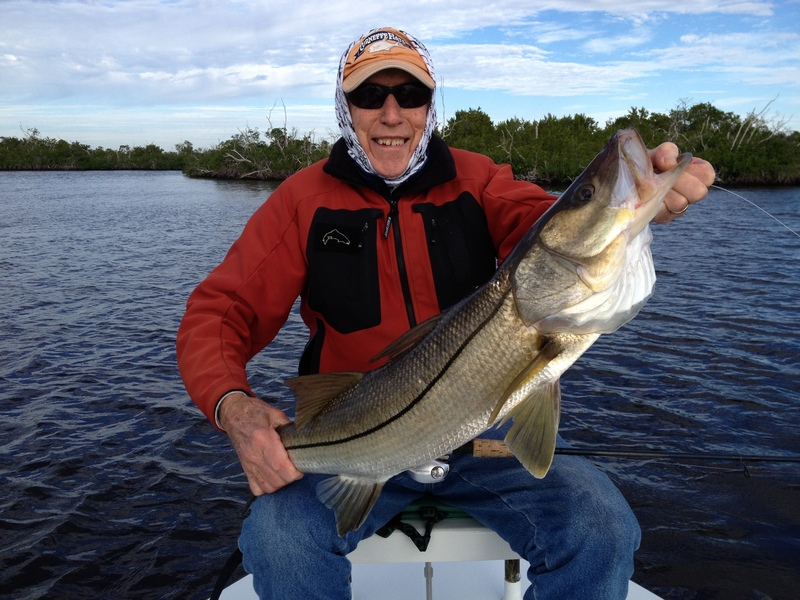 Kelly had worked for many years at Cape Canaveral but had always dreamed of becoming a fishing guide in his home waters of the Banana and Indian River watersheds. Upon retirement from his real job, he did just that. 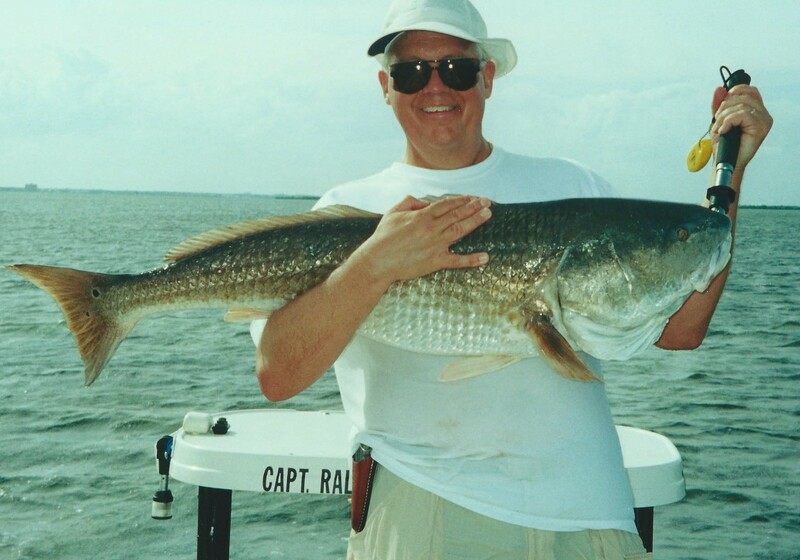 Kelly loved fishing for what he referred to as “Buuuulll Reds” in his slow southern drawl. 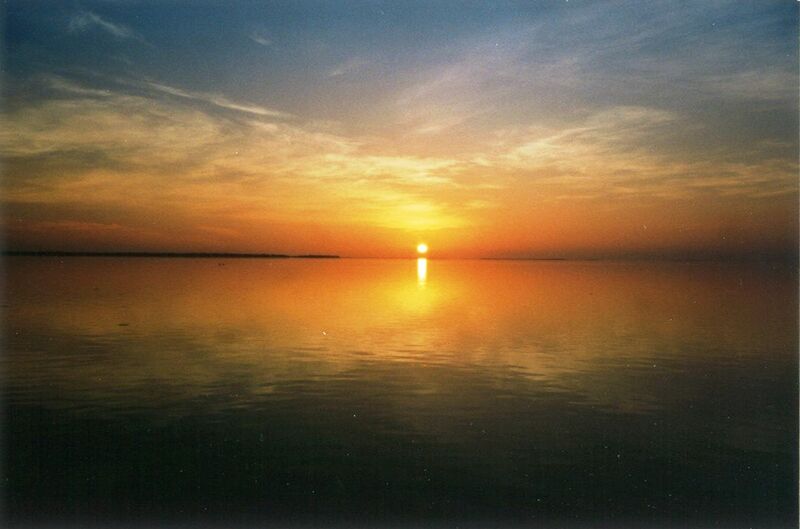 We agreed to meet at 7 AM on the causeway leading from Titusville to the Cape Canaveral National Seashore. After launching the boat, we stored our fishing gear and lunches and roared off in pursuit of redfish. 200 yards from the dock, the outboard engine began to sputter and after a few meek coughs, the engine died. Kelly administered first aid to no avail. He pulled the push pole from its chocks and poled us back to the dock. It was 7:15 am as Kelly apologized and said that perhaps we could fish later in the week after his engine was repaired. Unfortunately, the exciting baseball schedule permitted fishing only on Easter Sunday. I looked around. There were very few boats or trailers at the ramp or parking lot. Of course, most sane people were either at sunrise church service or sleeping in the church of the “holy comforter” getting their last minutes of rest before spending the day with their families. I asked, “Kelly, do you have any buddies who are guides? If so, maybe they do not have a charter and you could borrow their boat.” Kelly hesitated and I could sense the wheels grinding. I said, “Tell you what, Kelly, I’m going to go over to that picnic bench across the parking lot, sit down and relax. I have nothing else to do. Why don’t you do some checking and see if you can find a boat? Let’s fish as much of the day as we can.” I walked across the parking lot to give Kelly some space and time to come up with a plan. He went to a phone booth and began to make phone calls. 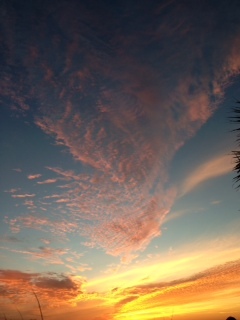 As the day rolled on, we had a few shots at redfish but caught nothing. My casting was mediocre as usual. At about 2 o’clock, Kelly floated the skiff towards a group of three teenagers who after exiting their canoes were wading about 200 yards from shore in water three feet deep. Bait buckets floated at their sides. They also had several nice redfish on a stringer which they were not shy about showing off. Kelly asked “What are they biting on?” “Mud minnows”, was the reply. “Got any extra?” “We could spare a couple.” One of the young teenagers handed Kelly a couple of mud minnows which he threw in the live well. After easing the skiff away from the wading boys, Kelly slammed the throttle forward as we raced to the mouth of the Indian River to a spot just outside the restricted area near Cape Canaveral. Once we were in position, Kelly hooked a mud minnow below an egg sinker and encouraged me to cast the rig as far towards the mouth of the creek draining the restricted area as I could. Moments earlier, he had warned me that unfortunately, the best fishing was INSIDE the restricted area. Not today, I thought to myself. The bait splashed into the tannin stained water which appeared brown as it reflected the cloud cover of a sheet metal gray sky. I reeled up the slack line and we waited. After about ten minutes, the tip of my rod began to pulse as a fish slowly pulled the mud minnow through the egg sinker. “Let him take it, ” Kelly whispered. I opened the bail of my spinning reel and let the fish run with the bait until Kelly told me to strike. When I struck, it felt as if I was attached to an automobile. The drag began to scream and for a what seemed like a half hour, all I could do was hold on. Finally, I began to gain line by reeling down towards the water and pumping back with rod. Repeat often. When the fish was twenty yards from the boat, we could see a hazy bronze flash from the light reflecting scales of its thick body. The fish began to steadily swim around the boat. Kelly had staked the skiff off and so when the fish circled, I followed the fish by walking with fishing rod held precariously over my head. I left the bow and wobbled down the six inch wide port gunwale. Around the stern the fish raced with his angler attached – then up the starboard gunwale. We repeated this tight rope fish catching dance three times. As I approached the starboard corner of the stern on trip four, I began to lose my balance and teeter towards the water. My past “falling in” fishing experiences, which had been frequent, informed my actions. I simply jumped in while holding the rod high over my head still tight to an irritated bull redfish. “What are you doing Rowe?”, Kelly screamed as his now wet angler standing in 3 feet of water. “Well, Kelly, it was either fall in and lose the fish or jump in and catch him,” I shouted with a smile in my loud voice. After climbing back on board, I was able to bring the redfish to the boat and Kelly hoisted it onto the bow. As I held the 30 pound red for pictures, I felt no guilt about my decision to play hooky from church on Easter! I am sure you understand why! Good morning on this July 4th. On this day we reflect upon the great freedoms we enjoy as citizens of the United States. The simplest and best is the freedom to enjoy family and friends. My family has been the greatest blessing in my life. Anyone who knows the Rowe family is aware of what a unique cast of characters we are! I am sure my loving wife Lauri and my wonderful children would tell you they have many interests beyond fishing. 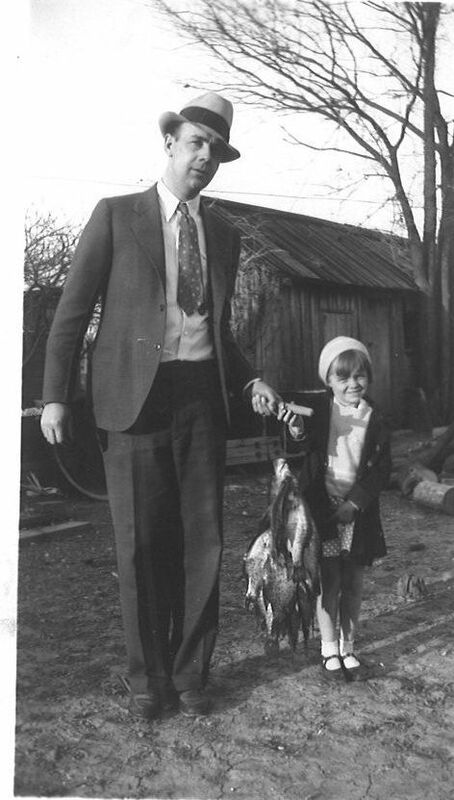 However, many of my fondest memories are of times spent together fishing! I love you all so much! My Mom started fishing at a young age! A Sunday catch Mom and Grandpa Hessey! 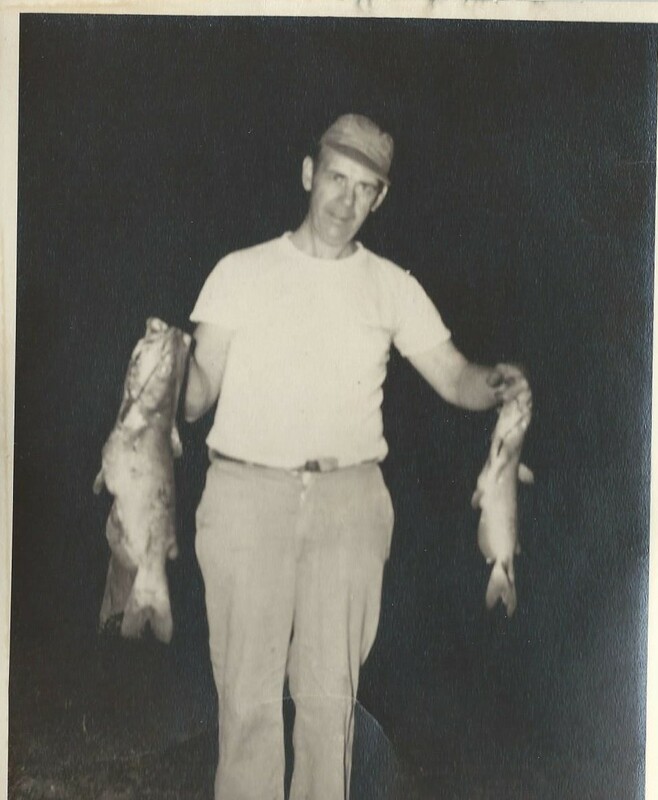 My Dad helped carry on the fishing fun. Lauri and I have fished together since our honeymoon. Andy and I primed and ready in the Keys! Pete Catches The Dreaded Rock Fish! I confess to having great adventures planned for my future fishing buddies! Izzie and Oompah have started already! Fishing is an activity which provides a foundation of adventure, success, and failure upon which family and friends can build a lifetime of memories. This picture of Capt. Steve Huff and Lee Mitchell was taken this spring in the Everglades. Lee and Steve salute a great day on the water! 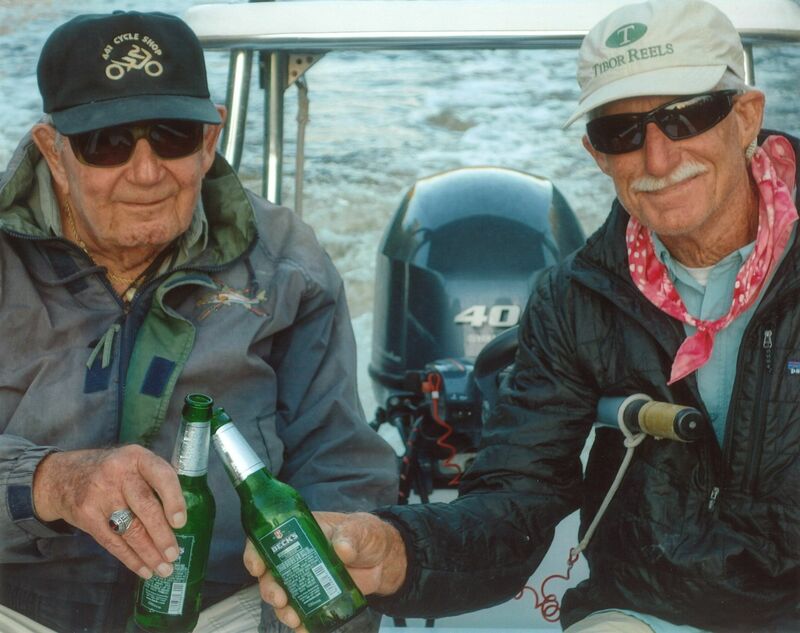 Their friendship is indicative of how time on the water with a fishing rod in hand can lead to a lifetime of memories and a phenomenal friendship. 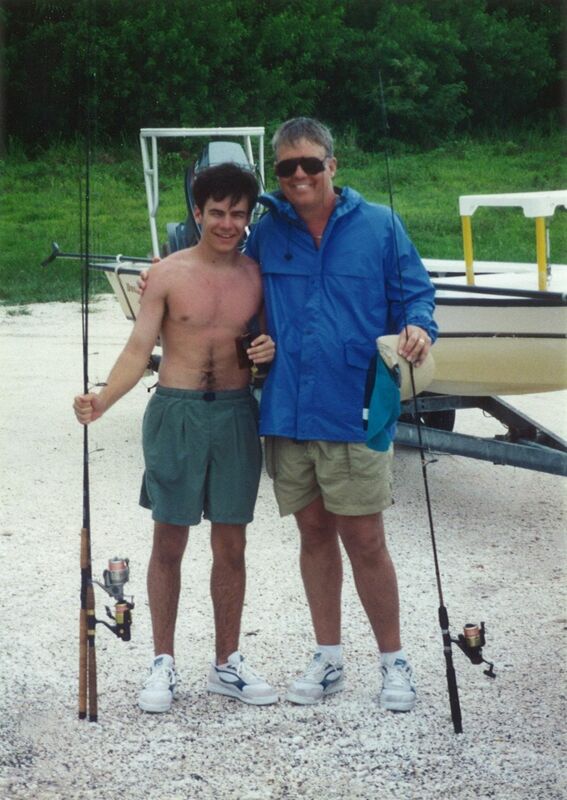 Lee first fished with Captain Huff as Steve’s career was beginning in the Florida Keys over 40 years ago. They have fished together for at least 500 days. Oh the stories they share! As you reflect upon your freedom, remember that nurturing family and friends is free of charge. The investment necessary is your time. A phone call to friend and family today would be a great way to show your appreciation for your freedom to love your family and friends! Have a great Fourth of July. The photo tribute below is my way of saying thank you to all of my fishing friends for a lifetime of memories! Frank Catchpole – What a name for an angler. We miss you Frank! You are one of the best guys I know! You also are a great dresser! Friends getting ready to fish! Pedro! That wahoo hides the fact that you forgot your shirt! Of course, celebrating a great day on the water is essential! Dinner at Key Colony Inn with Frank Catchpole, Steve Huff, Ron Souder, Lee Mitchell, Sherry Walls, Rich Mealy, and Ralph Walls! Dad and I headed to the Keys! In honor of my Dad on Father’s Day, I post this story written by my Dad to his Great Grandchildren! Lauri and I have just returned home from dinner with my Mom and Dad. I love them so! I post a story of his about washing dishes. I hope you enjoy it! Good things happen when you’re washing dishes with someone you love. “No husband ever got shot doing dishes”. Then I’d kind of nuzzle her with a little kiss on the back of her neck. Heck, think whatever you want, it worked. I’ve been doing dishes ever since. You can even have good man-to-man talks with your son, and maybe even a daughter, doing dishes. When your Grandpa or Uncle Steven Douglas Rowe was 6 or 7 years old, your Great Grandma was working afternoon and evenings at a department store to help put her hubby thru college. Your Great Grandpa had to get supper for the boys, and Stevie was big enough to help with the dishes. The thing is…doing dishes is a great time to talk with your kids, one on one. On that happy evening doing dishes, with Stevie just out of the blue he said: “Dad, isn’t boyhood wonderful!” “I guess so,” I responded, “but I think father-hood is pretty wonderful too”. “Yes Dad, but just think where you’d be if you never had a boyhood.” “Okay, but where would you be if I had never had a father-hood? That was one of my best talks with anyone about the “birds and the bees”. A person can learn a lot from his or her kids. Maybe sometime I’ll tell you the story of what else and how I learned about the “facts of life”. The thing is…I really just want you to learn to enjoy a lifetime of doing dishes. It was even more fun B.D.W. Back Before Dishwashers-I mean, the electric kind. Maybe you can do dishes with your “sweetie” and your kids, “when the dishwasher breaks down or the electric goes off”. It’s even more romantic doing dishes by candlelight. When the electric goes off-just set a candle in the kitchen window, sing your sweetie a little romantic ditty, kiss her on the back of the neck and soon you’ll have a kid to help you do the dishes. Enjoy those man-to-man, or if it’s more politically correct, those person-to-person talks with your kids, or is it, with your children. 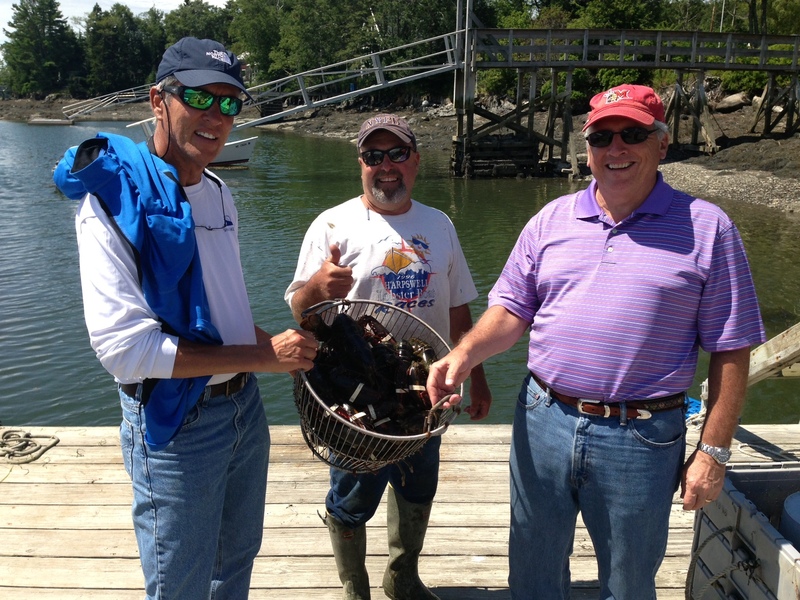 Greg Garris, Ray Noe, and Eric Gussler joined me for a half day fishing trip with Capt. Keith Logan of North Myrtle Beach Fishing Charters. As you can see in the photos and video below, a few of the coaches were under dressed for the chilly runs on the 22 foot fishing boat of Captain Keith Logan. Despite warnings, suffice it to say that the younger members of the coaching staff were dressed for wind chills in the 80s when in reality the wind chills were in the 50s. There is great joy in seeing someone catch their first fish. Eric Gussler managed to catch this gigantic sea trout after a LONG battle. He was excited and quite proud of the very first catch of his life! Capt. Logan began the trip by setting up on the down current side of an oyster bar where he expected that redfish might be swimming out of the shallow flats as the water fell with the outgoing tide. No redfish, but Eric did surprise himself by catching the sea trout. After about an hour, Capt. Logan ran the boat to a spot 3 miles offshore. He set up over an artificial reef created by sinking barges and other outdated ships in 30 feet of water. The Captain lowered the trolling motor which has the capacity to be programmed to engage the propeller as necessary to keep anglers over a GPS designated fishing spot. Logan’s fish finder showed scads of fish. We began to catch sea bass immediately. Not only did Eric Gussler catch the first fish of the day, he also caught the first sea bass. Eric using a 6 1/2 foot spinning rod loaded with 15 pound test braided line, struggled mightily with a hooked fish screaming at the top of his lungs about how tough his second fish was to land. He cranked the handle of the spinning rod as if he was creating hamburger from hunks of beef in an old-fashioned meat grinder. Profanities flew. Everyone peered over the side of the boat waiting eagerly to see what monster was putting such a whipping on Gussler. When he landed the fish, the boat went crazy. I would post the video but the audio is not for all audiences. However, the fish was so remarkably small; we decided that any fish caught of similar size should be called an “Eric”. Black sea bass are excellent to eat but a 13 inch minimum size is required. Steve Rowe caught one bass which measured 12 and 7/8 inches but none of the some 50 sea bass we landed were legal to keep so we returned to the dock with what I affectionately refer to as fishermen luck – an empty stomach and a wet tailbone. And we did have wet tailbones taking a few waves over the bow which soaked us to the bone! The bet on the boat was “rarest fish”! You be the judge. The action was hot and heavy at times! Sharing time on the water with good friends who are open to adventure is one of a fisherman’s great pleasures. It was a fun and enjoyable day! For any of you traveling to Myrtle Beach, I would highly recommend Capt. Keith Logan of North Myrtle Beach Fishing Charters. 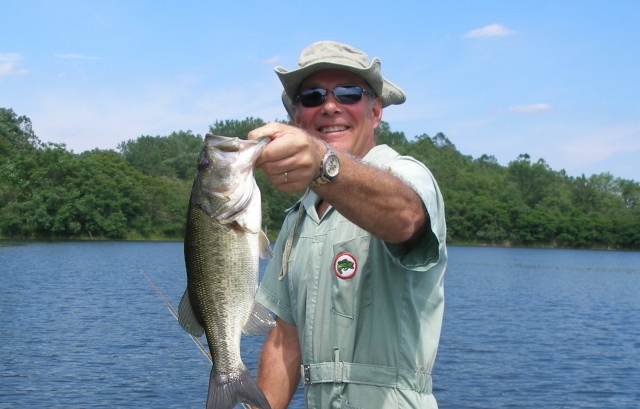 He is an accomplished angler, very supportive of people who are new to the sport, and a great conversationalist. All are traits of an excellent captain. Tight lines and Go Cards! Midway through the Florida Keys you can find a charming gulf side bar where my fishing group stops en route to our final destination of The Ranch House Motel in Marathon, Florida. At that point of the journey we need something for our lips – a Matecumbe fried grouper fish sandwich and an ice cold beer. The restaurant is known as Robbies. To the rear of the of the bar is a small marina which is famous for selling buckets of dead fish with which tourists (such as myself) can use to feed a group of tarpon who have come to depend on the free fish from Robbies for an easy meal. It would be improper to refer to these tarpon as wild but seeing 100+ pound tarpon up close and personal is something I cannot resist. So, in spite of my fishing buddies shaking their heads in disbelief that I would pay two dollars for a bucket of fish so I can throw them at what really amounts to tarpon in a large aquarium, I always do so. 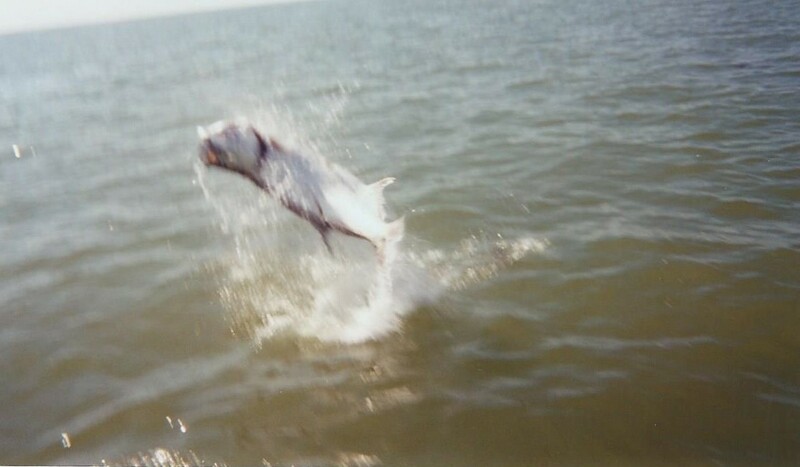 The tarpon compete for every fish chucked into the water. 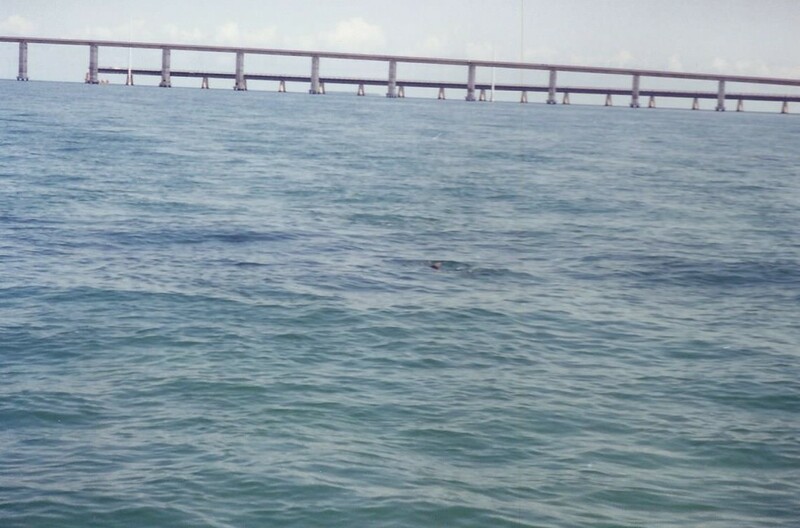 The water boils and occasionally a super quick jack can out run a tarpon for the bait. However, one must be careful. Strange people, no crazy people are often on the dock with you and will try the strangest fish catching techniques. There is always a good fish sandwich, cold beer and adventure waiting at Robbies. Fighting fish such as the unseen tarpon in the photograph above is fun. In the whole scheme of life, however, I fully understand that fishing is recreation and a passion for only a handful of people. For the last sixteen years, I have been blessed to know Coach Stephen Gussler whose passions are far broader and more important than fishing. His unquenchable fire for coaching young men the game of baseball is unsurpassed. His grasp of how to embrace the moments of each day and his dogged determination to be the best person he can be even when besieged by illness has inspired not only his players and the kids he teaches at Thomas Worthington High school but all the rest of us who have been given the opportunity by his example to learn how critical it is to cherish every day and live it to the fullest dimension our health allows. For me, an angler and baseball coach, there are undeniable parallels between the experience of fighting a great fish with the fabulous guides of the Florida Keys and my personal experiences with Coach Gussler both before and after he began his fight with colon cancer. For a fisherman, a fabulous fish fight begins with the hunt for a fish to which the angler can cast. When fishing the flats of the Florida Keys for bonefish, permit, or tarpon, I slowly scan back and forth across the water ahead and to the side of the skiff. I thrust my vision through the surface to the sand, turtle grass or coral bottom looking for signs of fish. Perhaps the water surface appears nervous, moving in the wrong direction. Sometimes a puff of sand known as a mud streams down current indicating that a fish is feeding somewhere ahead of the milky colored water. Occasionally, a moving shadow or the sun glinting off the tail of the fish probing the bottom for food in very skinny water provides a clue to the presence of the quarry. The hunt is a time of observation with no direct connection. Similarly, I observed Coach Gussler with no direct connection before I met him. While coaching as an assistant for Worthington Post 123 Legion baseball team, I observed this young, handsome, smiling, passionate baseball man while he stood in the third-base coaching box managing the Southway Legion team. As I observed his coaching style, Coach gave signs which made it clear to me that this was a man with worth knowing. His spirited yet friendly style demonstrated his passion for the game of baseball and enthusiasm for young people. I chuckled to myself as I observed the lanyard of the stopwatch sticking out of his back pocket indicating an attention to detail which in this case was his attempt to determine the precise time it took for a catcher to receive the baseball from the pitcher and release it while throwing to second attempting to nail a stealing base runner. When I performed the eye test on his players, it seemed that the performance of his team outstripped the athleticism of his kids. These and many other signs made it clear that a connection with this fine young coach would be worthwhile. 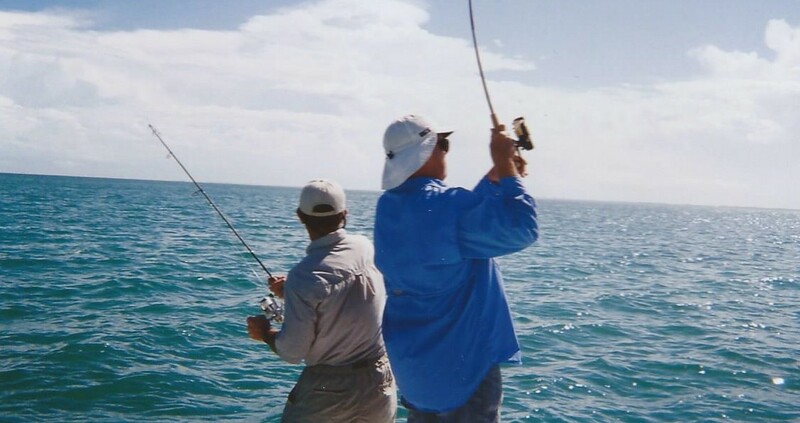 When fishing the flats, once a worthy fish is observed, it is time to cast a bait or fly in front of the fish so connection can be made. One learns quickly that being timid or hesitant does not produce results. Because we fish in very shallow water, there is an irresistible temptation to baby the shrimp or fly as you cast so as not to spook the fish. If I had a dollar for every time Guide Steve Huff shouted “don’t baby it, chunk it in there”, I would not need to head to work on Monday. Do not hesitate, get the bait in front of the fish is the rule. As my son, Pete, was beginning his senior year at Thomas Worthington, I knew the athletic director was looking for a new baseball coach. I did not hesitate! I picked up the phone and fired a verbal cast at then athletic director, Rich Seils. I asked Rich if he had a resume from a young coach named Stephen Gussler. I could hear him rustling papers on his desk. He replied that he did. “Have you interviewed him?” I asked. “No”, was the reply. “Well, I know he’s young, but I have seen him coach. You should interview him.” Apparently, the interview went well because Rich Seils bit and Coach Gussler was the new TWHS baseball coach. One of the keys to fishing the flats of the Florida Keys is patience. As I often say to my law partner, Michael, as he bemoans the effort it takes to catch walleye on Lake Erie, “Even I do not eat 24 hours a day.” Patience is rewarded when fishing the flats. If you put a shrimp,crab or good-looking fly in front of a feeding fish you will be rewarded with a bite. But you must be patient. Not every encountered fish is hungry. Coach Gussler’s first team wasn’t very good. He was frequently called upon to demonstrate patience throughout that first year and often since. His patience was memorably demonstrated to our family in a most startling way in the second game of a doubleheader at Marion Harding High School. On a brisk but clear spring Saturday afternoon, the mighty Cardinals managed to lose two ball games. Both by the score of 13 to 12. Pitching and defense were in short supply. Our son, Pete, was playing left field as a Marion Harding batter lofted a lazy fly ball in his direction. As he settled under the ball, Pete raised his glove in perfect position to make the catch. Just as the ball arrived, Pete stepped in a shallow depression in the outfield grass. His body went down, his glove went down, and the ball hit him square on the top of his large head giving off a resounding thud that sounded as if an observant shopper was thumping a watermelon in the grocery before deciding to buy it for a family picnic. Pete shouted a familiar profanity which was no doubt heard in Worthington some 40 miles away. Patience? Oh yes. The rookie Coach Gussler did not cause any bodily harm to his startled and embarrassed leftfielder as the parents and players from both teams laughed. Throughout my 23 years of fishing flats of the Florida Keys, I gradually through observation and trial and error became a little better at my craft. The title of my blog “Front Yard Fishing” is taken from one of the steps which I took to become a better angler. I practiced my casting on dry land in my front yard. Similarly, Coach Gussler’s teams gradually became better. Through his relentless efforts to teach, encourage, and support his athletes, his teams went from a collection of players who did not want to be in the field to make the last defensive play, or at the plate to knock in the big run, or on the mound to get the last out to teams that expect to win ball games with players who want to be on the field with the game on the line. Coach Gussler has demonstrated the uncanny ability of creating an atmosphere in which a young baseball player can begin his freshman year as a project and complete his senior year as an accomplished baseball player with the character and ability to contribute to a memorable and rewarding team experience. 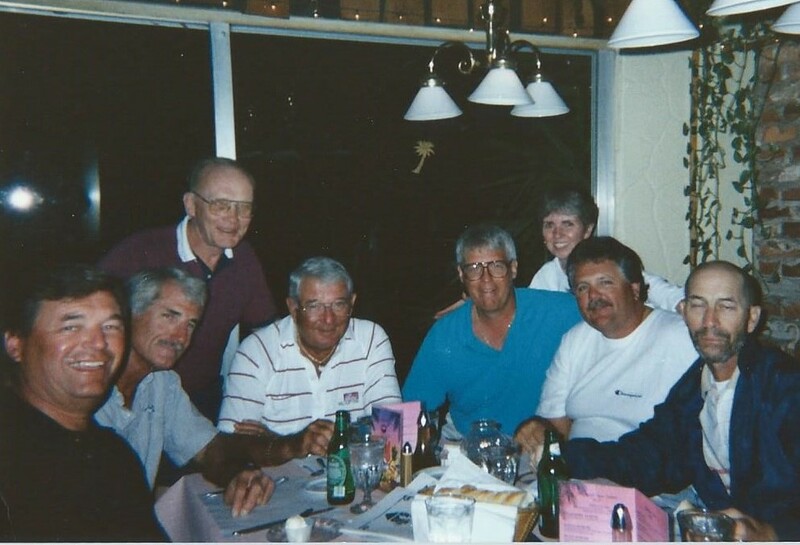 Just as my experiences in the Florida Keys have been made remarkable by the quality of the guides who helped make fishing memories for me and my buddies, Coach Gussler has surrounded himself with people who love baseball and care about one another. He has developed a remarkable coaching staff comprised primarily of young people who have played for him. They love the program, they love him. 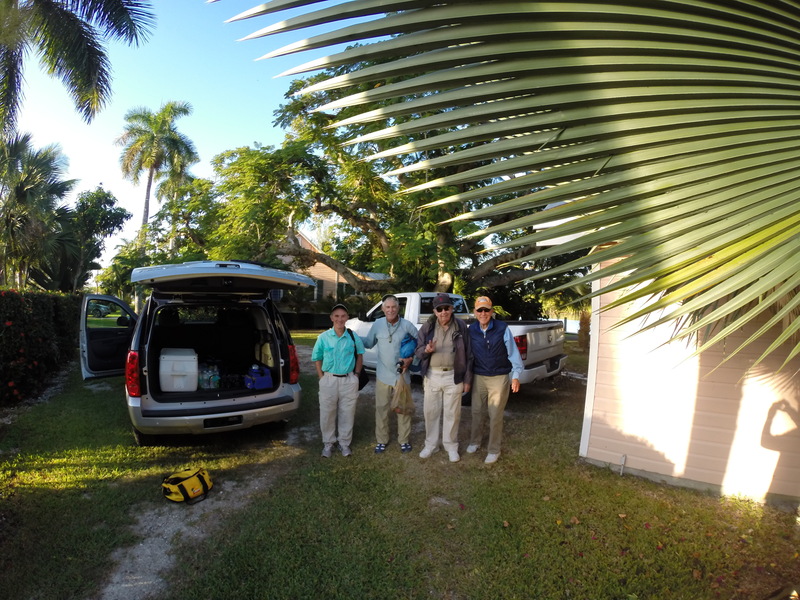 Just as a fishing guide in the Keys must permit his angler to catch the fish while providing quality instruction and support, Coach Gussler has developed the willingness and ability to delegate responsibility and allow those who coach with him to take responsibility for various areas of the program. I know there are times when Stephen would coach or instruct a skill in a different fashion than his assistant. However, he has the wisdom to allow the assistant do it his way without interference knowing the team will be better off if he trusts his assistants to deliver the message. 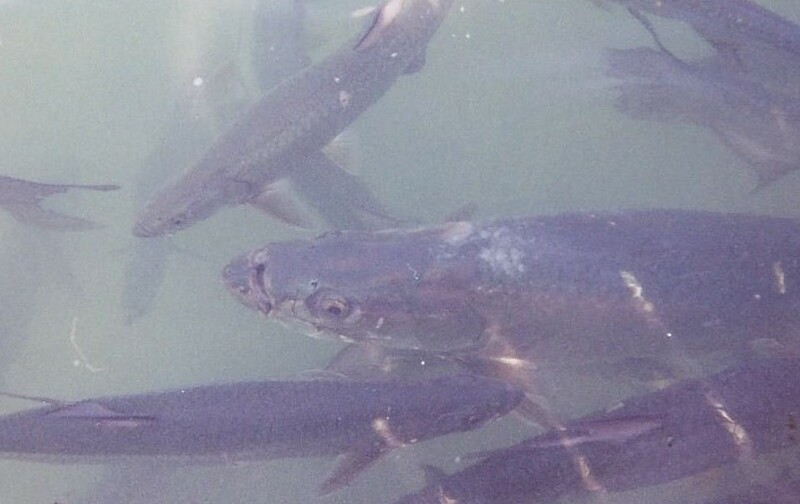 All anglers who have had the privilege of fighting a hooked bonefish, permit, or tarpon should appreciate the experience as a connection to a wild creature of nature willing to do anything to live another day. Coach Gussler has that same irrepressible determination to live. His fight against cancer has been waged during a time when his teams have had their most on field success. Two league championships in a row. Two district championships in a row. State Coach of the year in 2013. Winning has been fun. But learning from Coach Gussler about living, loving, and passion has been more rewarding than championships. Remarkably, the most fun I had in my many years of coaching at both the youth and high school level came after our regional semifinal defeat last year. We lost to Hilliard Darby 15 to 13. It was a terrible baseball game. We made six errors. We could not get anybody out. The game lasted a draining three plus hours. Dreams of going to the state tournament were unfulfilled. The ride home on the dreaded hard seated yellow school bus although short in distance seemed like it would never end. The silence on the bus was thick with disappointment. Once the bus parked in front of the well-worn batting cages adjacent to the ball diamond, Coach Gussler and his assistants hugged and thanked the players as they trudged down the steps of the bus and headed off for the last time in 2013. Coach Gussler was not well that day. He was in pain and clearly exhausted. Regardless, he sat down on an island of grass in the parking lot as the rest of us gathered around him. Within minutes, the defeated varsity coaches were revisiting how terrible the team played despite how “great’ we were as coaches. Smiles emerged. And then we began to talk of the future. Coach Gussler spoke of the starting lineup for next year’s team. He demonstrated for those of us who assisted him a most important human quality, the ability to hope. Coach put down his physical pain and the anguish of a lost opportunity for his team and cast his gaze to the future with optimism and excited anticipation. We joined him with the joy of a future worth contemplating in our minds. In two weeks, that future becomes the present. Practice begins, games will be played, and Coach Gussler will be our leader. Water, Water Everywhere – But Of What Quality In The Florida Keys? In ninth grade, I first studied poetry. My imagination was stirred by the images and words contained in “The Rime of the Ancient Mariner”. I was required to read and memorize portions of this poem first published in 1798 by the English poet, Samuel Taylor Coleridge. The poem relates the experiences of a sailor referred to as the Mariner who has returned from a long sea voyage with a tale to tell. He tells his story to a man who is on his way to a wedding ceremony. The wedding guest’s reaction starts with amusement but quickly moves through fear and fascination as the story progresses. The Mariner’s tale begins with his ship departing on a journey to the south. Although the trip begins well, the ship is driven off course by storm eventually reaching Antarctica. An albatross appears and leads the troubled ship away from the ice but as the albatross is being praised by the ship’s crew, the Mariner shoots the bird. The crew is angry believing the bird had brought the South wind which gently blew their ship out of the icy Antarctic. The sailors blame the Mariner for the torment of their thirst. As a result, the crew forces the Mariner to wear the dead albatross about his neck to illustrate the burden he must suffer for killing it. Eventually, after encountering a ship of death, all the crewmembers die. The Mariner lives on but he is cursed. For seven days and seven nights the Mariner sees the last expression on the face of each dead crew member. The curse is partially lifted only as he begins to appreciate the sea creatures swimming in the water. Despite his cursing them as “slimy things” earlier in the poem, “Yea, slimy things did crawl with legs / upon the slimy sea”, he suddenly sees their true beauty and blesses them. As he manages to pray, the albatross falls from his neck and his guilt is partially forgiven. The bodies of the crew possessed by good spirits rise again and steer the ship back home, where it sinks in a whirlpool, leaving only the Mariner behind. The Mariner is saved by a hermit but as penance for his killing of the Albatross, he is forced to wander the earth telling his story to each individual he meets. Pondering those words, I can only conclude that God loves water. Water is necessary for human beings to live and for fish to swim. As a fundamental requirement of being a human being living in this marvelous world each of us should recognize and take responsibility for protecting as best we can the essential elements of life. The water we consume and in which the bonefish swim is such an element. As I began this series of blog notes concerning the plight of the Florida Keys bonefish, I raised the question of what an individual angler could do to make a difference. The words “water, water, everywhere, nor any drop to drink” have run through my mind like a broken record. 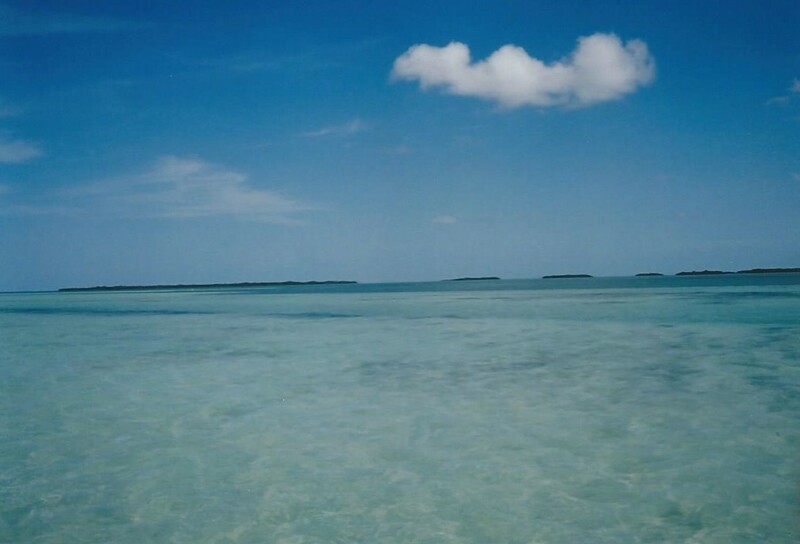 Without habitat, including seawater, of appropriate quality, the bonefish will disappear. That bonefish and other species thrive in healthy saltwater and provide anglers with unparalleled opportunities to catch remarkable fish and make memories that last for a lifetime, can be seen in the pictures below which tell the story about the need for life giving salt water in which bonefish can thrive. The parallels with the tale of the Ancient Mariner are clear. Our Albatross is water itself. If the actions of human beings kill the quality of water, there will not only be no water to drink, there will be no life. And so the question of caring for the resource extends far beyond an anglers hope that bonefish will have water habitat in which they will swim, spawn, and thrive. And the bonuses anglers will receive from sustaining the quality of saltwater are profound. When we fish, we experience the uncanny beauty of nature and stories of great friends and fish. 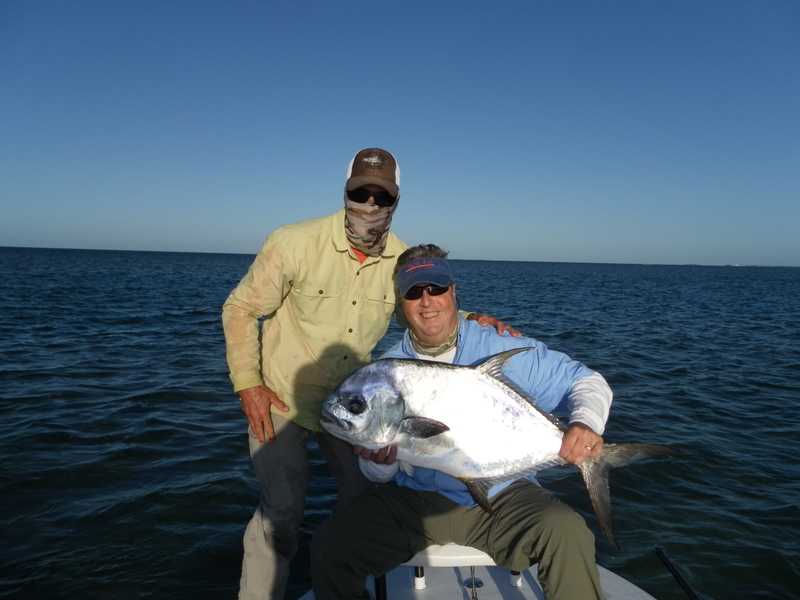 A double on permit with a great friend, Bob Hamilton. 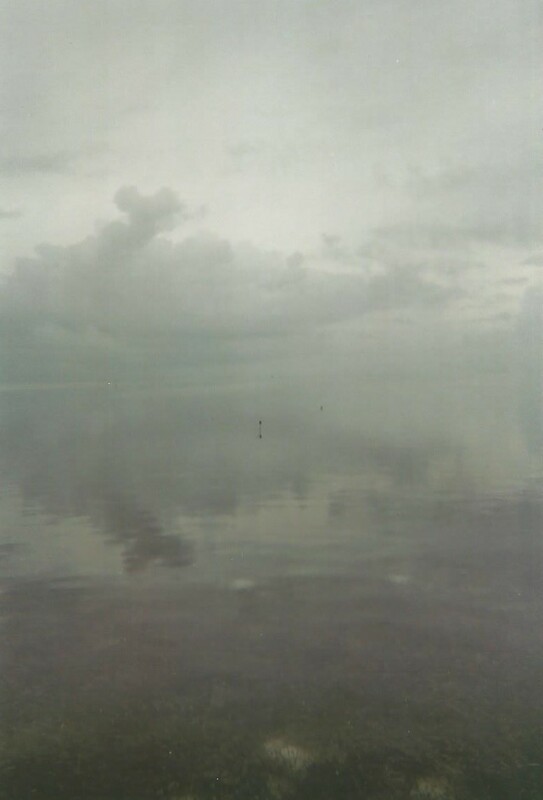 Tranquility as calm sea meets gray sky creating an infinitely distant horizon. Mangrove islands caressed with bright rays of sun reflect off life-giving seawater. Vistas from singular highways and bridges within sight of schools of daisy chaining Tarpon. Mirrors of sand in shallow water reflecting the beauty of a sharply blue sky and providing avenues of travel for healthy fish. So what can I do? Here is my plan and promise. 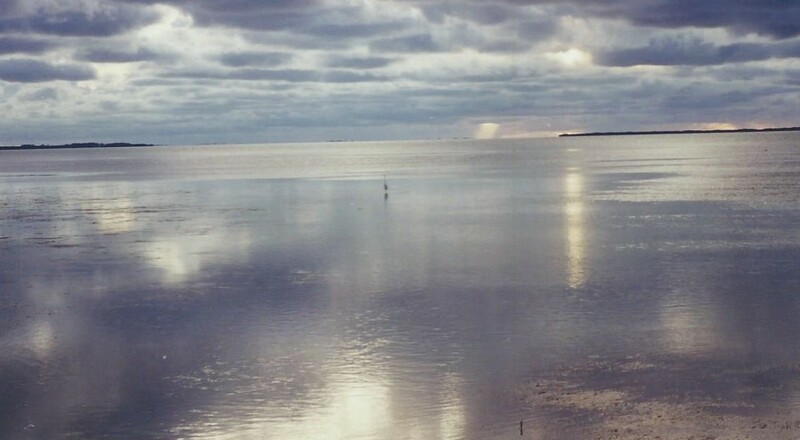 Even though I live in Ohio and have not visited the Florida Keys for two and half years, I will treat water wherever I am as if it represents the sea creatures which the Ancient Mariner begins to appreciate which appreciation causes the albatross to fall from his neck. 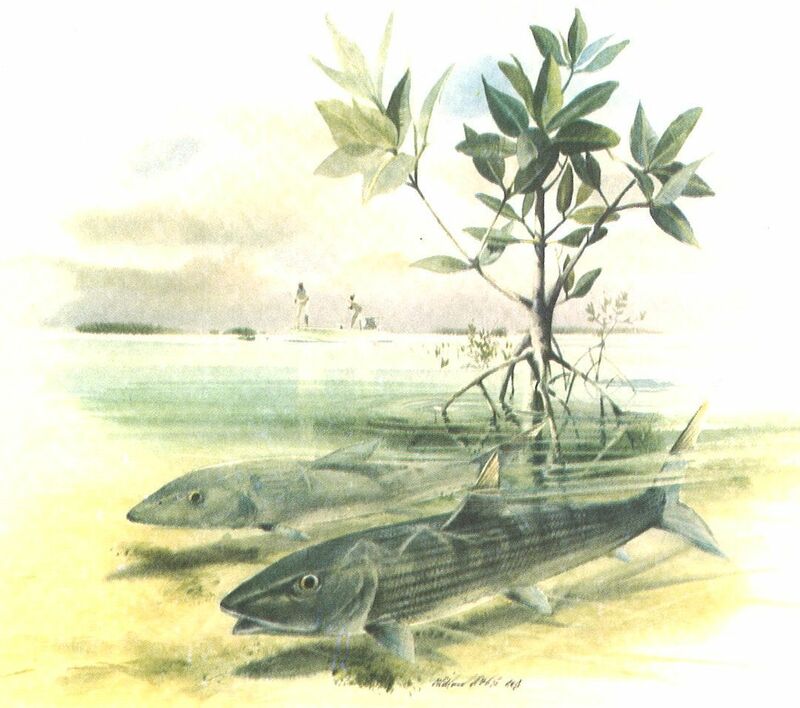 The salt water in which the bonefish swims is a resource. The water I use in my daily living is the same resource. I will demonstrate my commitment to the bonefish, by conserving the resource in which it swims. Regardless of where that resource is located. And here is how I have begun. Perhaps you agree there is nothing better than a hot shower. Personally, I favor long, long hot showers. 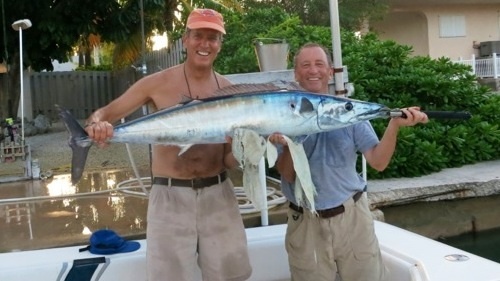 In fact, after a day fishing on the flats of the Florida Keys, there is nothing more pleasurable than a long hot shower which rinses away the speckles of salt which cling to your body as a result of boat spray, fish slime, and the perspiration of an angler standing on the bow of the skiff for eight hours in a hot benevolent tropical sun. Despite my love of long hot showers, for the last three weeks I have been taking “Navy showers”. They are simple enough. Turn the water on. Get wet. Turn the water off. Shampoo your hair. Soap your body. Turn the water on. Rinse off. Turn the water off again. I have no idea how much water is saved by a Navy shower but the commitment to the resource is more important than the quantity. I am convinced that if we all do just a little bit better with whatever resource we care about, the resource will make exponential gains because many people care enough to do a little. When I shave, I turn the water on and off. When I brush my teeth, I turn the water on and off. When I do dishes, I turn the water on and off. Before, I let the water run while each of those simple daily tasks were completed. My wife and I have had our first conversation about what kind of chemicals we will put on our lawn when the snow melts and the sun angle rises high enough in the sky to grow grass. I hope we can come to an agreement that whatever chemicals we use, if any, will not do damage to the water flowing in the Olentangy River where I fish for smallmouth bass not 300 yards from my home. The Senators and Representatives from Ohio will receive letters from me. These letters will request that they explain why the subsidies continue for Big Sugar which uses fertilizers to grow sugarcane in Florida. These fertilizers release their chemical components into the groundwater that ultimately flows through the Everglades attacking water quality in Florida Bay. Florida Bay is the astounding but besieged estuary which provides life to bonefish and an infinite variety of saltwater creatures. Of course, I confess to a high level of skepticism about whether or not a letter from an individual citizen will make any difference. On the other hand, what harm can it do? Clearly, it is not realistic to expect Congress to have the necessary political will to make changes for the better of the country unless I have sufficient political will as a citizen to stay informed and express my opinion in a constructive way to those who can make a decision and a difference. And so I pledge to continue to take steps to conserve on the amount of water I use as a human being. I also pledge to refrain from putting chemicals in places where water will carry those contaminants to rivers, streams, lakes, and oceans. I have also resolved to take the time to become informed about water quality issues and to ask my political representatives to make decisions based upon a fair balance between the needs of the citizens of our country and the reality that our water resources are limited and tainted. Finally, I urge you to conserve any resource about which you deeply care. If not water, then something else. I also ask that you keep yourself informed about issues which will affect all of us now and our families and nation in the future. The Ancient Mariner bore a curse generated by a mindless disregard for the value of the albatross. His shipmates bore a terrible price. The poet concludes that the penance of the Ancient Mariner was eternal. Let us be mindful of the natural consequences of our choices as we care for the water we use so that neither we nor future generations will have an albatross of responsibility hanging from our neck. My Grandma Rowe was the most beloved member of our family. She died at 102 years of age and is missed by all who knew her. A preacher’s wife, her life’s mantra was serving others. As a young child, I struggled being able to imagine Grandma chasing chickens around the barn yard of a family with a new baby. The story went that she caught the chicken, wrung it’s neck, scalded the carcass, plucked the feathers, prepared a fried chicken dinner, served the family, then did a kitchen full of dirty dishes which had accumulated as the new mother recovered. Grandma broke my heart when she told me as I unleashed my early teenage attitude, “Steve, you have become quite a smart aleck haven’t you?” But forgiveness quickly granted was her style. All of her Grandkids loved spending time with her even if it meant losing a game of Aggravation to this highly competitive woman. As I began fishing we had an activity we loved in common in addition to the bond of love which kept us close. Every year before heading to the Keys to fish I believed it would be good luck if I called Grandma to tell her I was headed to Florida to go bonefishing. ” I don’t know”, I would reply. “Release them,” I would sheepishly respond. Grandma, you may well be right about the grand creation plan of God, but when it comes to bonefish, I release what I catch. All who love any aspect of this earth should enjoy the resource while at the same time treating it with respect. The term “catch and release” is not new to the fishing world. I can honestly say that I do not know of any bonefish kept by my fishing buddies in Florida. Every bonefish we caught since 1988 was released. As of September 1, 2013 bonefish caught in Florida must be released which is a measure long over due. Releasing a caught bonefish is only part of the battle. The whole process of catching the fish affects chances of survival. A few tips. Fight the fish with appropriate tackle. Fisherman seem to thrive on bragging rights. It goes something like this. “I caught a 10 lb bonefish on 4 lb test mono or tippet!” So what? Use sufficient line or tippet strength as well as an appropriate rod and reel to land the fish quickly. The shorter the fight, the higher the survival rate. On many occasions while in the Keys my buddies would return to share stories of a bonefish being eaten by a shark or barracuda. 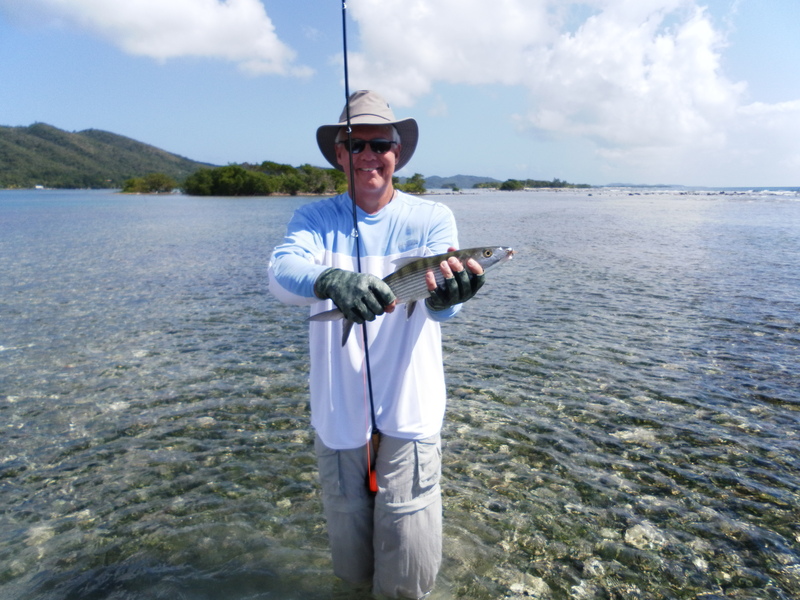 Trust me, it is hard to want to break off a hooked bonefish when a shark is in the area. Why? Ego, the heat of the battle, focus on the catch…no matter. If you see a predator start to chase your bonefish, break it off immediately. Or if an already streaking hooked bonefish suddenly accelerates as it peels line of a smoking drag, clamp down on the line and bust him off. A shark or cuda is surely chasing the fish whether the angler sees the predator or not. Or if you have landed the fish with sharks in the area, move to another location before releasing the fish. Once you have a fish at the boat there is a simple equation. The math works like this. The less exposure, the less handling equals the best release. I have many pictures of bonefish. Some of these fish were out of the water too long. And handling the fish for a picture will inevitably remove some of protective slime of the bone. The slime is the coat of armor of the fish so leave the fish armed. Take the picture while the fish is in the water or do not take it at all. 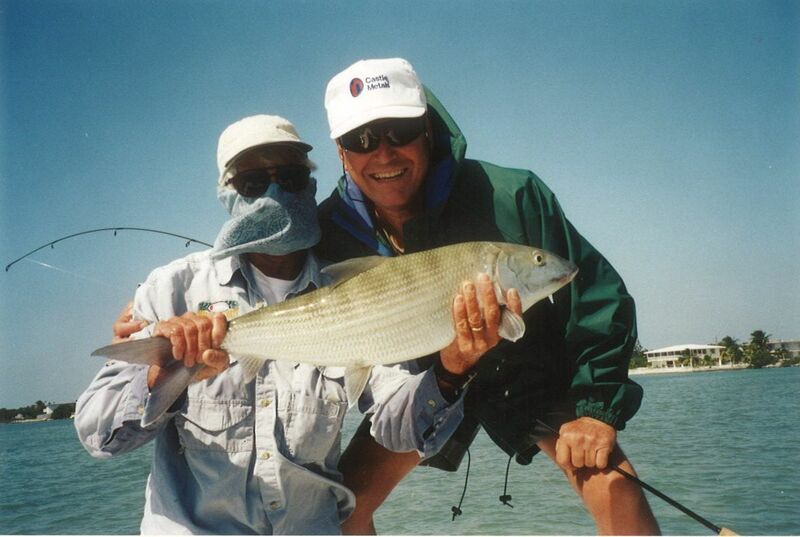 As you release the bonefish hold it by the tail in an upright position and be patient. Keep the bone upright and when it has sufficiently revived from the fight you will feel a surge as the fish is prepared to swim off. Only then should you release the fish. If the fish falters as it swims off retrieve it and start over. Fly fisherman should use barbless hooks and bait fisherman should use circle hooks. There is much more but the point is this. If you care about a fish, a plant, a pet, a forest, a beach…or anything in this marvelous creation, you have a duty to protect what you claim to love! And so Grandma Rowe, I must say again. I do not eat bonefish. Yes, some creatures may exist to provide food. But God put some creatures on this earth to remind of us of the pure joy of the wild! Bonefish are just such creatures.